Pozieres in France is ‘more densely sown with Australian sacrifice than any other place on earth’, in the poignant words of the official historian Charles Bean. Among the 1916 Pozieres casualties was George Larsen - a respected young farmer of Danish descent from the small town of Nobby on Queensland’s Darling Downs. George had enlisted in the 1st AIF on 31 July 1915 in Toowoomba, and was placed with reinforcements for the 15th Infantry Battalion. He served in Egypt and France but died on 9 August 1916 from wounds received two days earlier during the fighting at Pozières. His remains rest in Puchevillers British Cemetery (grave reference Plot II, Row E, Grave number 9). George was born in Nobby on 26 August 1896. It is a small rural town about 40kms south of Toowoomba, but notable for two of its one time residents – Arthur Hoey Davis who under the pen name Steele Rudd wrote the humorous and popular book On Our Selection about small struggling farmers Dad and Dave; and Sister Kenny who was a pioneer in the treatment of polio. His parents were Anthony George Larsen, a farmer from Helsingor in Denmark, and Anna nee Petersen, also from Helsingor. Anthony and Anna had married in Maryborough in July 1886 and had four older children when George was born. After attending Nobby State School George took up farming, and that was his occupation when he enlisted, aged 18, on 31 July 1915. As he was under 21 written parental consent was necessary and forthcoming. George’s older brother Charles had already enlisted on 6 January 1915 in Charleville. Charles served in the 25th Battalion at Gallipoli and on the Western Front, and was twice wounded in action. On enlistment George was 174 cms tall, weighed 70.8 kg, had grey eyes with light brown hair and a fair complexion, and his religion was Presbyterian. George and another recruit were farewelled at Nobby on 10 August by ‘a representative gathering’. There were speeches and a number of toasts, and both men were presented with a gift – George’s was a ‘silver-mounted pocket wallet’. George embarked in Brisbane on the transport vessel HMAT Seang Bee A48 on 21 October 1915. On arrival in Egypt the reinforcements were merged with the surviving veterans from Gallipoli and underwent training as well as a period guarding the Suez Canal. This was an interrupted time for George as he spent two periods in hospital – once with mumps and once with influenza. In May 1916 speculation mounted among the troops that a move was imminent, and that proved accurate. The 15th Battalion embarked on the SS Transylvania in Alexandria and arrived in Marseilles on 8 June 1916. From there they travelled by train to the north of France. After detraining in Bailleul on 10 June the 15th Battalion went to billets at La Maison Blanche where, the Battalion history noted, ‘for the first time since leaving Australia, straw lay beneath our blankets in the open airy shed where we were billeted’. The middens at the back of all the farm houses astounded the Australian born, who, unfamiliar with this method of conserving animal manure for field purposes, admitted its economy, but disliked intensely its close proximity to the residential quarters. Many of these men declared themselves stronger adherents than ever to the artificial manures in general use in Australia. After a month that included some time in the reserve trenches near the front line, the 15th Battalion – as part of the 4th Australian Division - trekked to the Somme to the Pozières sector. The 1st and then the 2nd Australian Divisions had already suffered horrendous casualties taking and holding Pozières and a nearby ridge. One of the wounded was George’s brother Charles, who suffered a bullet wound to his left thigh on 29 July 1916. ‘It was impossible to penetrate this devastating curtain of fire in platoon or any other form of close formation without suffering heavy casualties, so throughout the early morning the Battalion filtered through in small parties’. ‘The greater part of the front line system occupied by the Battalion was shallow and in parts it was nothing but a shambles. The dead lay everywhere, partly buried within the parapet or parados, or lying exposed within the trench and the open country to the immediate front. Narrow, shallow dugouts with galvanised iron roofs or no roof whatever, were the only shelters for the men’. George was wounded sometime on 7 August 1916 – we don’t know whether it was while clearing the trenches and burying bodies despite shells still falling, or during the furious melee of hand-to-hand fighting as the Germans pressed a final counter-attack, or during the very intense German shelling throughout the night of the 7th. Two days later at the No 3 Casualty Clearing Station George died from what was recorded as multiple wounds. He was buried the same day at the Puchevillers Military Cemetery, with the Rev WM Woodburn presiding. In October 1916 at the monthly meeting of the Nobby Red Cross Society ‘Sympathetic reference was made to the loss of Privates Henry Gullet and George Larsen, who were killed in action at the front. Both were highly respected young men of the district. A vote of sympathy was passed to the bereaved relations, all member standing’. 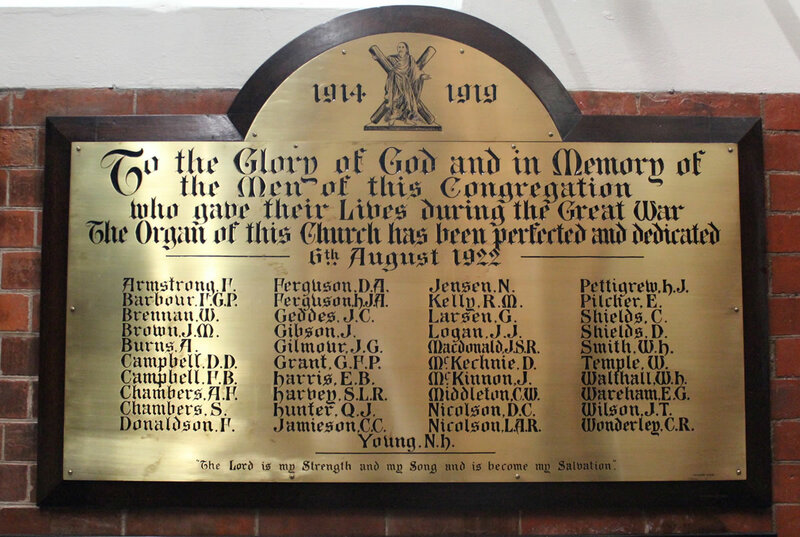 As well as the Roll of Honour at the Australian War Memorial, George is commemorated on the Memorial Gates at the Nobby State School, on the War Memorial at Greenmount near Nobby, and on a brass plaque in Saint Andrew’s Church in Brisbane city listing those with a connection to that congregation who made the ultimate sacrifice during the First World War. • Bean CEW. ‘The AIF in France in 1916’ Vol III Official History of Australia in the War of 1914-1918. Sydney: 1929-1940. • Chataway TP. History of the 15th Battalion. Brisbane: William Brooks, 1948. • Brisbane Courier. 3 August 1915 p8; 11 August 1915 p6. • Darling Downs Gazette. 20 October 1916 p6.